Welcome Aboard IHC185™ Internet Horology Club 185 IHC185™ Discussion Site Main Page Open to the World RESEARCH FORUMS South-Bend Watch Company Research Forum What does "HTG" stand for? Could someone please tell me what the South Bend 0 size watch grade "HTG" stands for? Both symbols "HTG" and "HC" denote hunter style movements, those that set at the 3:00 position. As wristwatches became more popular many 0-size and smaller movements were cased as wristwatches. There are also survivors that began in a Hunter Case that were later modified so they could be used as a wristwatch. 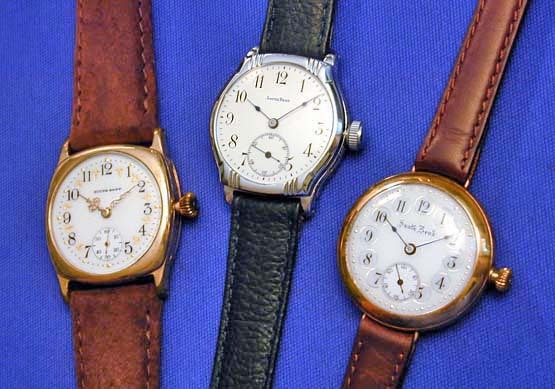 South-Bend wristwatches with 0-size Hunter movements from Lindell's collection are shown below. Thank-you Melvin and Donald. The watch I was researching was in fact a Hunter cased 0 size with the pendant at 3:00 just as you said and the dial and hands look exactly like the watch in the center from Lindell's collection. Quick Reply to: What does "HTG" stand for?